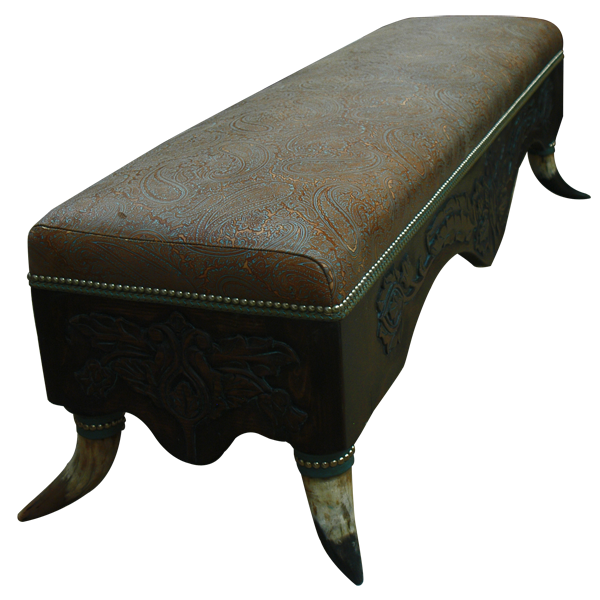 This gorgeous, handcrafted, Western style bench features an exquisite, solid wood apron on its front and on its sides. The apron has elegant, Western curved details, and it is adorned with hand carved, floral details. Designed without a back, the comfortable, well padded seat is upholstered with rich, dark brown, patterned, full grain leather. Bordering the upholstery is a faded, turquoise colored, leather braid, and the upholstery and the leather braid are separated by hand tacked, gilt nails. The bench rest on sturdy, inverted, cow horn supports, and the hilt of each horn is embellished with turquoise color leather and decorative, gilt nails. It has a dark finish, and it is made with the best, sustainable, solid wood available. The bench is 100% customizable.